In December My Yoga Online (Gaiam Tv) started advertising their 21 day yoga challenge. The above picture was their main campaign picture. Every time throughout December I would sort of sneer when I saw it. Yeah sure commit to me?! With what spare time!? 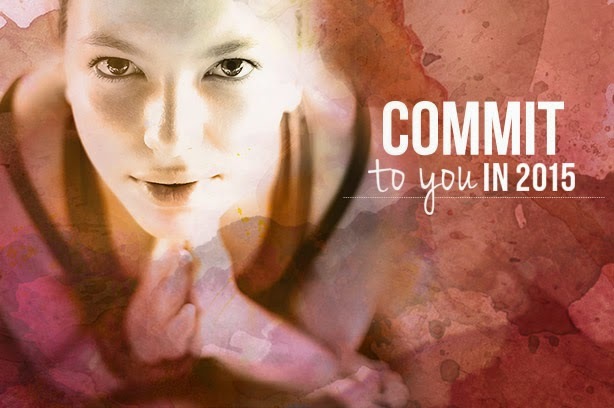 Commit to doing yoga every day for 21 days? Not possible!!! Yet the image and the message kept haunting me. In the back of my mind I thought I need to do this. I don't know why and I don't know how but I need to do this. Approach everything with an open mind. I realized right off that I had a lot of anxiety around not being able to choose the videos that would be assigned to each day. Would the teacher be annoying? Would I hate the music? Would it be too hard? It took about five days for my anxiety to fade and to just open my mind to whatever the days video would bring. In the end I practiced styles I never would have tried, found new teachers that I love and had some deeply profound meditation sessions. I had to admit, if I had never taken this challenge I would have kept using my same five saved videos. Stop saying can't and start trying! I am more of a beginner yoga person. I like the easy classes and the easy poses that I can do well. I think most of us look for the easy safe route when we have the chance. Not so with these videos! Early on I found myself plopping down on my mat thinking in my head I can't do that pose. Nope not that one either. Without even trying, I had some how determined that certain poses I couldn't do. Then one day I thought well maybe I will try. This particular day was Bakasana pose. I positioned my knees up on to my triceps and slowly leaned forward. My toes lifted off the ground about a half inch. The teacher said, "Just play with it." My heart soared. It wasn't the pose itself, it was the attempting and not failing that felt HUGE! From then on whenever a pose came up that I thought I couldn't do, I went for it. I played with it. Sometimes it's not about having the time, it's about finding the time. You might not think there is a difference between having and finding time but I assure you there is. As a personal trainer I am up at 4 AM and get home after 8 PM. My day is packed with helping other people commit to their goals and their journeys. I was determined to do all 21 not days which meant I had to find the time to squeeze it in. In doing this I found I became very efficient in my day. I found time in between clients or sometimes I woke up an hour earlier to get it done. Don't beat yourself up. With the above being said there were days I missed. At first I got mad at myself. I should have done this and I could have done that. Bla bla bla all the negative self talk chattering around in my head. In yoga they say a lot "come back to the breath". And so I did. Big picture, did it matter if I missed a day here and there? No. Could I start right back up the next day? Yes. It made me realize sometimes we beat ourselves up over nothing and it really is a waste of time and energy. Shavasana really is the most important pose in yoga. Any class I have ever taken they always say this. Inwardly I always roll my eyes. I don't have time to lay down for 5 minutes crazy yoga people!!! If you are unfamiliar with yoga, shavasana comes at the end of practice. Shavasana allows the body a chance to regroup and reset itself. In the first few practices I found myself skipping this part. After spending usually 50-60 minutes doing yoga really I didn't have 5 more minutes to just lay around. I started forcing myself through those last 5 minutes though. It was amazing the transformation that happened both mentally and physically. Think about it, when was the last time you sat still for 5 minutes, just breathing, not thinking, just calm? I bet you can't think of it! In summary it was an amazing adventure. I would highly suggest that everyone try something for 21 days. Something just for you and no one else. Do something new or something that you have always wanted to try. Watch the way your mind tries to hinder you. Watch your body and thoughts change. I noticed with in 10 days that I felt stronger and more flexible. I mentally felt that I could try anything, I mean, heck, if I could do bakasana pose I could do anything!